Mad Men recap: It's Peggy's time to shine. 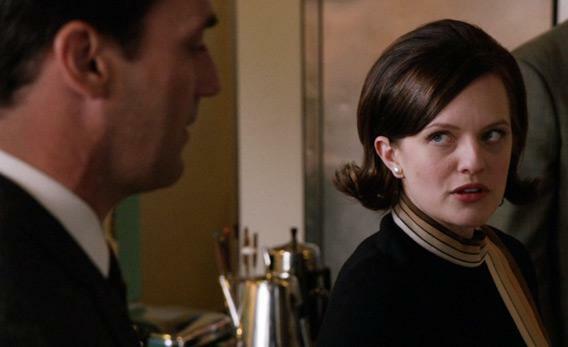 Mad Men recap: It’s Peggy’s time to shine. It’s Peggy’s time to shine. How fitting that it was Freddy Rumsen who encouraged Peggy to leave the SCDP fold. Don eventually became Peggy’s mentor and champion, but Freddy is the one who discovered her copywriting talent and got her put on the Belle Jolie account, way back in Season 1. Don may think he’s responsible “for every single good thing that’s ever happened” to Peggy, but Freddy found her first. I’m torn about Peggy’s departure. On the one hand, this episode and indeed this entire season made it easy for us to root for Peggy to leave SCDP behind. As you noted, Julia, she suffered indignity after indignity this week—the lobster, the greenbacks in the face, Joan’s partnership (which must have hit Peggy particularly hard, as she has no idea about the indecent proposal). And we’ve seen her struggling at SCDP all season long. To her credit, Peggy took on the role of tutoring the boss’s wife without complaint, but her efforts came to naught when Megan decided to follow her acting dreams. (Though not before the apprentice upstaged the mentor by coming up with the winning idea for Heinz, a conspicuous failure for Pegs.) The arrival of Ginsberg threatened Peggy’s place as the young star in the copy department, as Harry Crane thoughtlessly reinforced when he asked to introduce Peggy as Ginsberg’s subordinate during the Chevalier Blanc call. And I think Freddy’s right: Despite all of her successes, the old guard still see Peggy as a secretary, one who made it because they were magnanimous enough to give her a shot. She needs to go some place where she walks in on Day One as a touted talent. That said, what a wonderful goodbye. At the end of the Mad Men pilot, Peggy reaches across Don’s desk to put her hand on his, thinking it’s her responsibility as his secretary to make herself available to him. Don yanks his hand away, barking “I’m your boss, not your boyfriend.” Last season, at the end of that great episode in which Peggy and Don pull an eventful all-nighter working on the Samsonite campaign, it was Don who reached for Peggy’s hand, a gentle thank you for seeing him through a trying moment (the death of Anna Draper). And then last night, that wonderful kiss on the hand, an acknowledgement, it seemed to me, that these two people have shared much, much more than just a professional relationship, even if (thankfully) it always remained chaste. I’m going to miss having this testy but battle-tested duo at the center of the series. Patrick, what did you think of Don’s response to Herb-from-Jaguar’s proposition? There’s no question that Don had Joan’s honor in mind; particularly after their sweet exchange last week, it’s clear that Joan is the other person at SCDP he actually respects as a human being. But I couldn’t help wondering whether he also wanted to prove to himself that his creative department could carry the day. It was thrilling to see Don once again in full-on salesman mode, marching into the meeting at the head of SCDP’s phalanx of troops. Yet he’ll never know whether it was his pitch or Joan’s sacrifice that carried the day, and so once again this season, we watched a character greet success with disappointment. This may be a beautiful victory for the firm, but it’s not one Don can truly own.